The much-anticipated day arrived this week; my grandma turned 100 years old. I saw relatives I haven't seen in decades, met relatives I had never met, talked, laughed, ate, watched old videos, took photos, posed for photos, and just generally had a great time. And that was just Wednesday! 1. I'm thankful for a safe flight. Photo: My feet on the (new) carpet at PDX. When in Portland, take a foot photo on the carpet. It's the rule. 2. I'm thankful for the beauty that is ever-present at my parents' home. 3. I'm thankful that the weather cooperated. It changed no plans, and I still got to watch snow fall one morning. 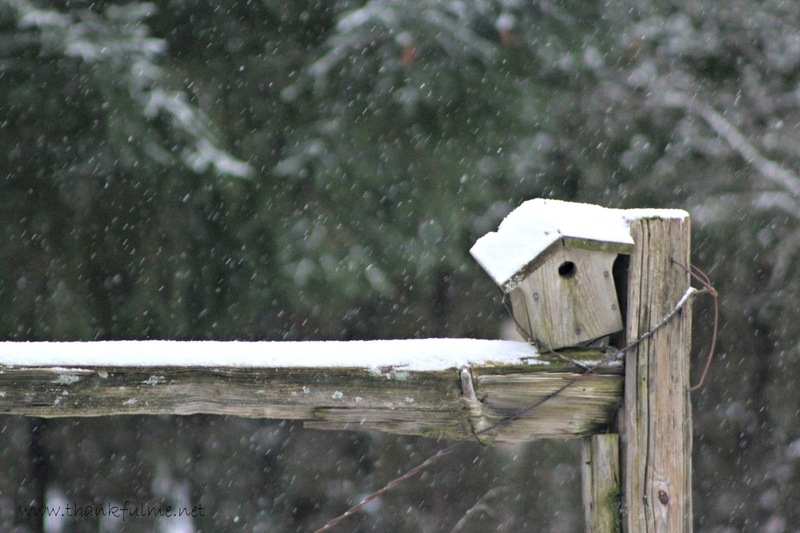 Photo: Snow falls on a birdhouse. 4. I'm thankful Grandma had a good time at her party. Photo: Grandma adjusts her crown as she talks to my uncle, cousin, aunt, and mom. 5. I'm thankful for cousins, even though we don't see each other nearly often enough. 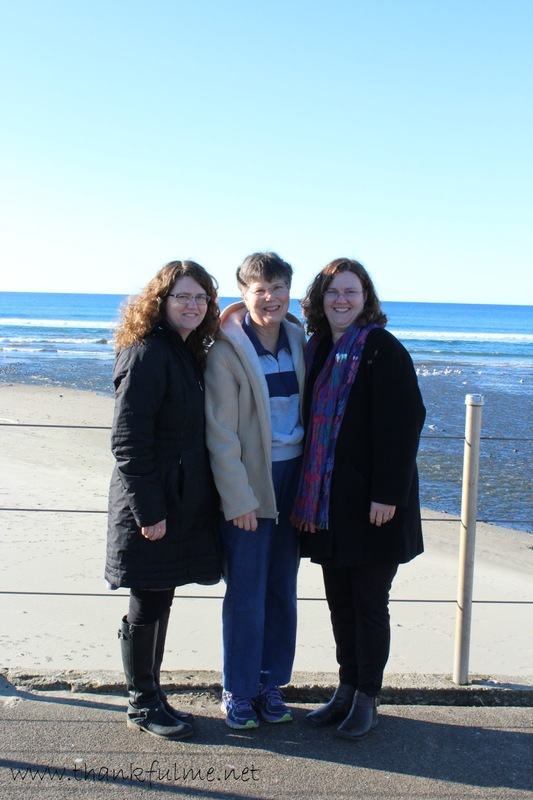 Photo: My sister and I with two of our cousins, also known as the "Wait! Don't leave before the 'cousins' shot' " photo. 6. I'm thankful that my sister, mom, youngest daughter, and I could spend some time together at the coast on Thursday. 7. 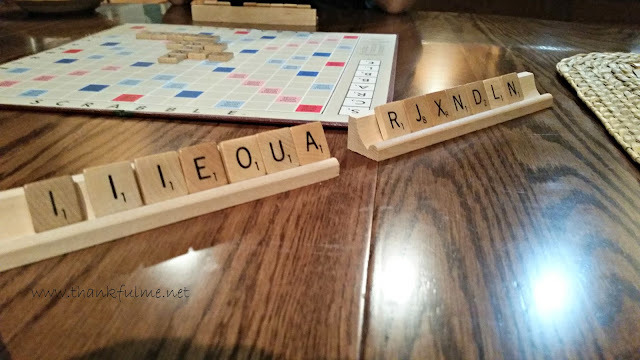 I'm thankful for Scrabble games, even when I have all the vowels and my sister has all the consonants. 8. I'm thankful for laughter. Sometimes we didn't even know what was funny, but boy, did we laugh! 9. I'm thankful that even though I didn't see my brother while I was in Oregon, I got to see him yesterday. He had a business trip that brought him to Anaheim, so after he was done with his meeting, we got to have fun in Disneyland. 10. As always, I am thankful for John. He held down the fort while I was gone. He played host for a nephew and his wife as they stayed a couple of nights here. For a couple of days before I left, I wasn't feeling well, and he took care of everything and just let me sleep. Thanks to his help and the power of prayer, I had recovered from the stupid cold in time to make the trip. 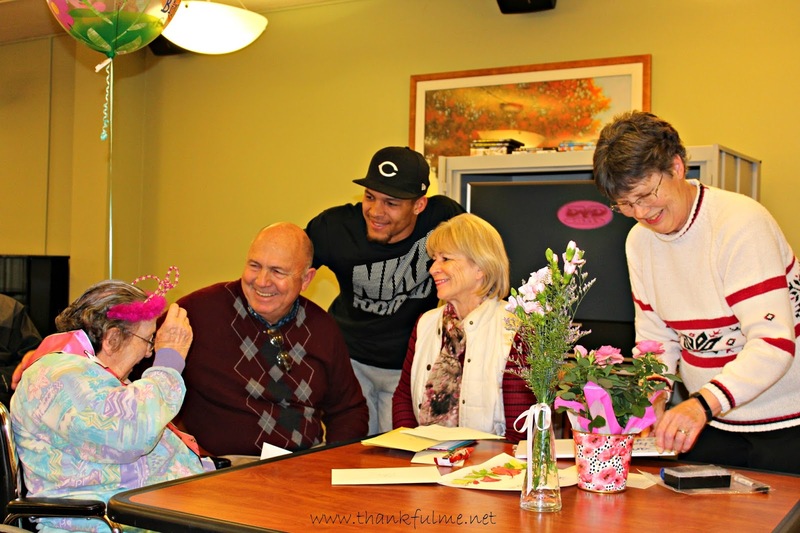 I highly recommend 100th birthday parties, and celebrating with family and friends! Hope you had a wonderful, thankful week! Please pass along my best wishes to your grandmother. Multi-generational meet much? yow! do I see four generations (and are there not 5). nice looking ocean in the background. I take it that the constant rain is either exaggerated or in the next state up.... not real strong on my geography. Only 3 generations are pictured above, but there were 4 generations in attendance. You are right, though--my grandma has great-great-grandchildren. Pretty impressive! 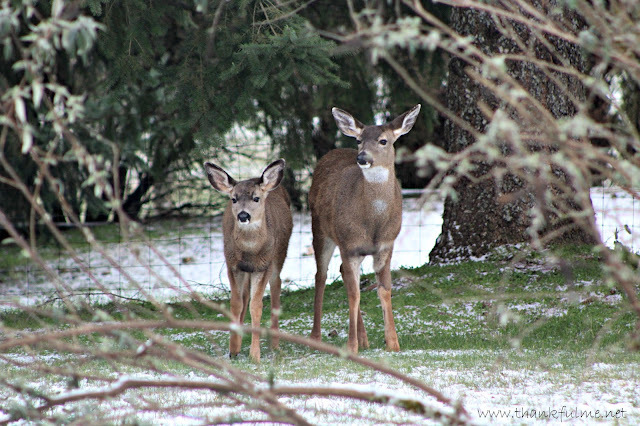 Oregon and Washington both have lots of drizzly, grey, rainy days. (At least the western side of the states--the east side is another climate.) When the sun comes out, though, the landscape is stunning! I happened to be there on mostly clear days, amazingly. The nature shots are gorgeous. But-oh, my! Let's talk about Grandma's 100th birthday. That is simply amazing. I pray she has continued good health. The photo of her adjusting her crown as her admiring fans look on suggests to me that she is of sound mind as well. Tremendous blessings! Well, the sound mind part isn't quite right. She does have Alzheimer's, which is a horrible disease. She had a very late-onset variety, though, and lived independently into her 90's. It is sad to watch her decline, but she is a sweetheart. I just now posted and hadn't read your post. What a funny pair we are! I ended my post with a comment about the laughter. HaHa. See what I learned from my daughters. HaHa. Happy Birthday to your Grandma. Times with family are so much fun. Lots of times my tiles in Words With Friends look like one or the other of those hands. Your grandmother is beautiful. I'm thrilled that you had a special party for her and that so many family members were able to attend. Definitely wish your Grandma a happy 100 years and may she enjoy many more in good health and happiness. Seeing a loved one decline, as you mentioned, is truly heartbreaking, but gosh her spirit shines through in your photos! So glad the 100th party was well attended and successful. My Dad will turn 91 this month, still living mostly independently at home. What a blessing to get together with beloved cousins and such, and for a happy occasion too! Thanks for sharing. These are priceless memories being made, and the joy witnessed by the photos is truly contagious. I am so glad the weather cooperated and you felt good enough to go. Family get-togethers across distances are so rare, and always such a good time! A wonderful ten things to be thankful for! Happy Birthday to your Grandma! I want to live to be 100 and I want to be healthy enough to enjoy it. Glad she got to be surrounded by family on such a special day. I always knew she would make it to 100. She kept active all her life, and even now, scoots herself around in her wheelchair, making the rounds at the care facility. Happy 100th Birthday to your grandmother! What an incredible milestone. Regardless of her state of mind, I've no doubt she felt the love from family and friends surrounding her. OK. What gives? :D "When in Portland, take a foot photo on the carpet. It's the rule."? 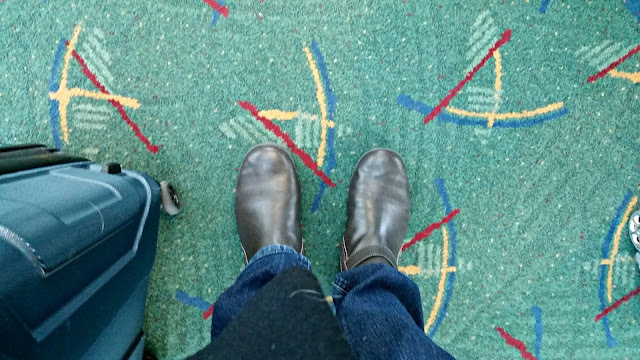 Some things just defy explanation, like Oregonians love of the PDX carpet. I don't think as many people take selfies with the new carpet, but I figured, why not? The removal of the old carpet actually made national news: http://www.nbcnews.com/watch/nightly-news/only-in-portland-would-the-airport-s-carpet-reach-cult-status-388489283993. I'm about a week late, but what a lovely post! 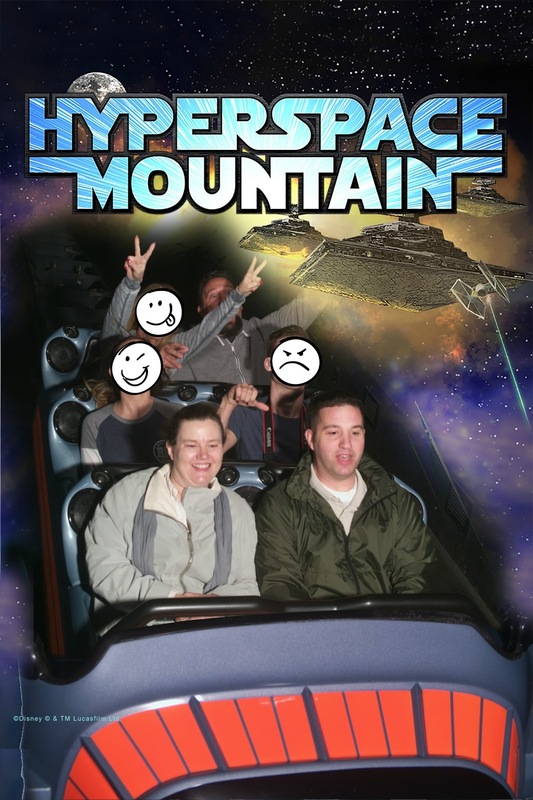 You looked like you had such a fun time! Thanks for stopping by! I see you've joined in with your own TToT post--welcome! 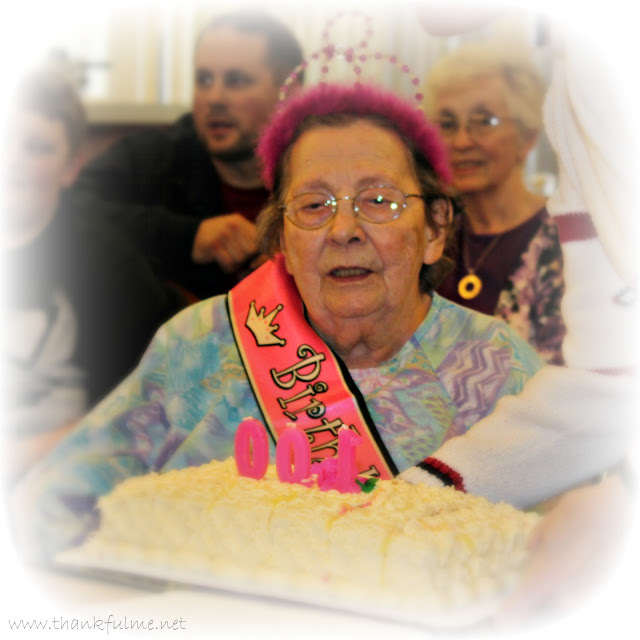 Hi Kristi, I just found your blog and enjoyed your grandma's 100th birthday party pics. She sure looks wonderful! Thanks for sharing your weekends 10 thankfuls. Thanks for stopping by! Always good to meet new friends!